Our Preformed Gourmet Cookie Dough is delicious and convenient. That’s right, it’s already shaped and ready to bake. Even better, your supporters can now choose from 8 flavors, including our new mint chocolate chip, decadent caramel pecan chip and popular M&M. At only $17 per box, they are affordable for all! Cookie Dough in a Box! This is cookie dough fundraising made convenient! You and your supporters simply have to place and bake the preformed cookies, and you’ll have delicious gooey treats for family and friends in no time at all. 8 Delicious Flavors: Peanut Butter, White Chocolate Macadamia, Snickerdoodle, Cinnamon Oatmeal Raisin, Classic Chocolate Chunk, and 3 new flavors - Mint Chocolate Chip, Caramel Pecan Chip and M&Ms! Expect the demand to be so high that it will become an annual fundraiser! Every box of preportioned cookies contains 40 (1.08 oz) preformed cookies, for a total of approximately 2.7 lbs of cookie dough. Quality & Convenience: Cookie Dough may be frozen up to 1 year, has a shelf-life of 21 days at room temperature. The product can be thawed and re-frozen. It can remain in the fridge for up 6 months. Zero Trans Fat, Kosher Product. May contain traces of nuts. FREE to Start: The Preportioned Cookie Dough fundraiser costs absolutely nothing to get started. 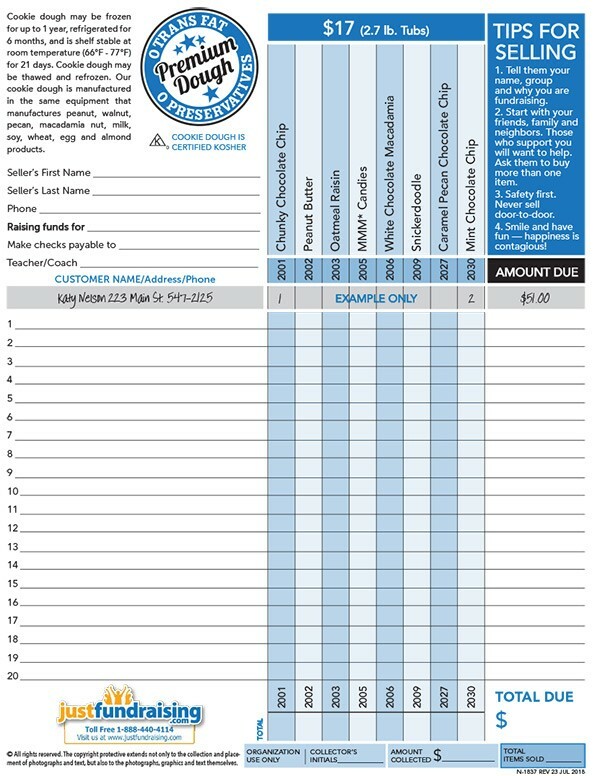 Simply let us know how many fundraising participants you have and we’ll send 1 order-taker for each of them, at no charge. Reach Your Fundraising Goal: Your profit varies from 30% up to 55%! Smaller groups can aim to sell at least 336 boxes, which is at the 40% profit level, for earnings of over $2,285 profit. Larger groups can aim for the 55% mark. Priced To Sell: Only $17 for a box of 40 (1.08 oz) pre-formed cookies. Simply place and bake! Distribution day made easy: It can be kept at room temperature (66-77 degrees or cooler) for up to 21 days before being refrigerated again. So no need to have parents and volunteers rush in to collect their cookie dough during a tight 2-hour time window. *Orders less than 150 units incur a shipping fee calculated as follows: $1 x (200 - qty sold) The profit amounts shown include any shipping costs. How Does the $17 Preportioned Cookie Dough Fundraiser Work? 1. 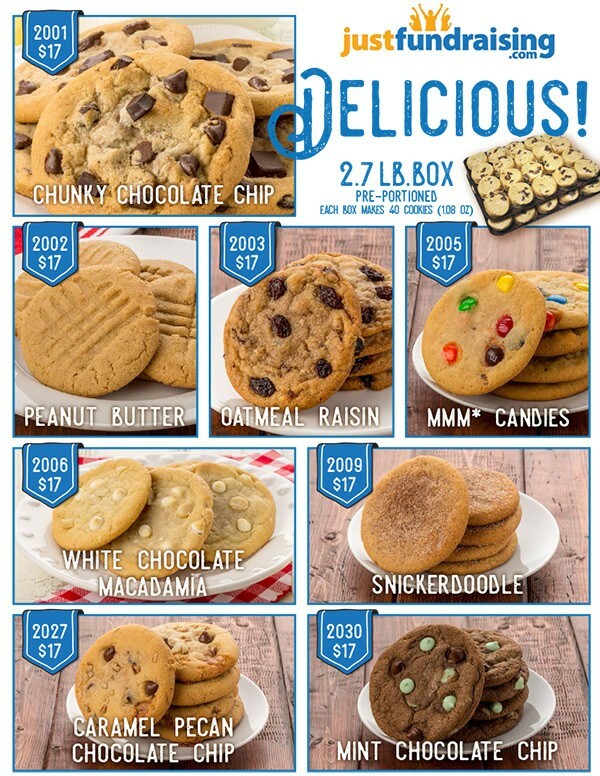 Order 1 $17 Preportioned Cookie Dough order-taker PER fundraising participant – they’re FREE of charge! 2.Have your group members show the order-taker to friends, family, neighbors, and or co-workers and invite them to purchase 1 or more tubs of cookie dough. (Note: Your participants will collect the funds up-front, and will take note of their supporter’s name and mailing address on the order form included). This was our first time trying this fundraiser and we were very pleased with the results. Our chorus group raised over $3,000 profit for a trip to Disney world! Our Polynesian dance team is made up of 20 dancers, We're raising money for competition fees. We managed to raise $936 profit with JustFundraising's preformed cookie dough and are pleased with the results. We raised over $1,000 for our cheer team with this fundraiser. Everyone loves the different flavors of cookie dough and the ease of having them pre-formed so they are ready to bake.